Do you love to travel but HATE packing? 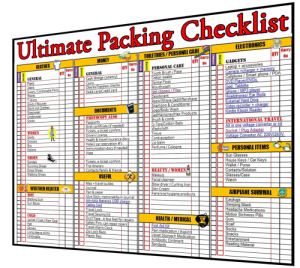 Just sign up for free email updates and download my Free Universal Packing Checklist! You don’t even need to think with this list. Just check off the things you want to bring then follow it mindlessly and quickly until you’re done. VOILA! With everything you have to remember, you are bound to forget something but not anymore! Keep up to date with what it’s like to live in France and how to take a sabbatical from life to live in France for a year or two. No more yelling at the kids or stressing out over everyone’s packing. Now they can practically pack for themselves.